Before heading West towards Colorado Springs, CO, we asked folks on a RV forum what was the best route — Interstate 70 or 80? They said take Highway 36 across Kansas — which turns out to be the old Pony Express route. 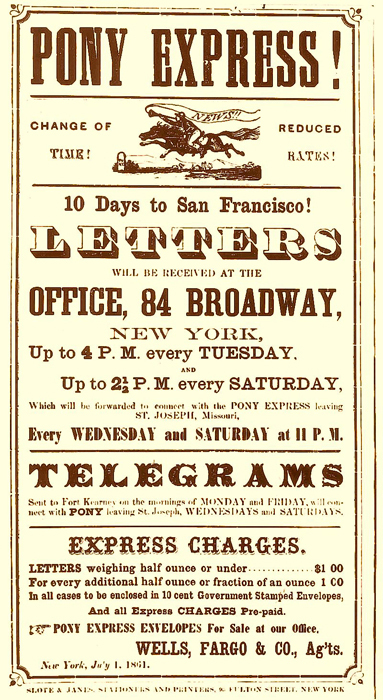 “10 Days to San Francisco!” the poster says. Hell, we’re taking that long to just get across Kansas. As we crossed into Kansas, the landscape changed. It was like our eyes went to wide angle — the horizon went on and on and . . .
We still have some rolling hills, but it’s looking more and more like Flatland. Don’t know where you are at this moment. Hope you’re keeping track of all the rain and flooding in Colorado that may be affecting Colorado Springs also. Keep us in tune. Hoping all is going good for you all.